At the 40th Birthday party in Ringaskiddy today: l-r John Mullins, Chairman, Port of Cork; HE Stéphane Crouzat, French Ambassador; Christophe Mathieu, CEO of Brittany Ferries; Jaime Gonzalez, Port of Santander. 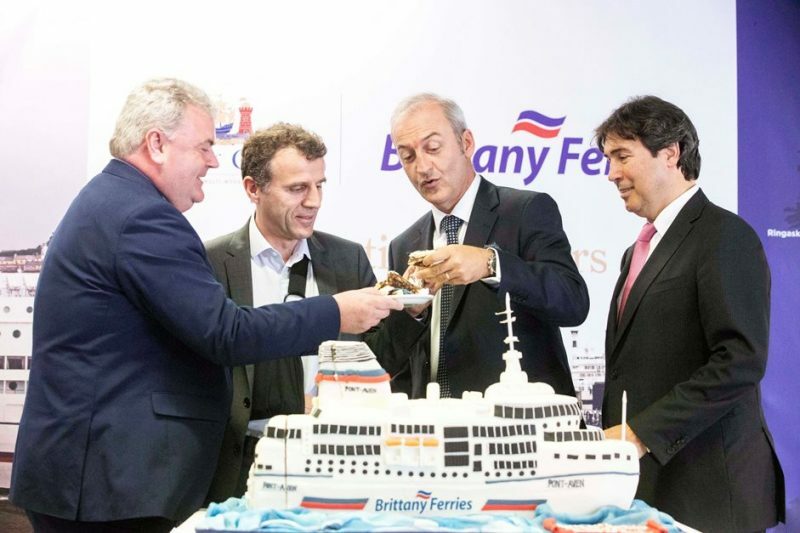 While Irish Ferries are in the doldrums with their WB Yeats ship stuck in dry dock for the rest of the year, it was all smiles and birthday cake in Ringaskiddy this morning as celebrations were held to mark the 40th anniversary of the launch of Brittany Ferries’ Cork-Roscoff route. In May 1978, Brittany Ferries launched their Cork-Roscoff ferry route from Cork City Quays with their flagship ‘MV Armorique’. At the time, all ferries departing Cork used the passenger terminal at Tivoli, before being transferred downriver to the dedicated Ringaskiddy Ferry Terminal which opened in 1982. Since then, the passenger and freight route linking Ireland and France has gone from strength to strength and today the Port of Cork acknowledged this service by wishing Brittany Ferries a Happy 40th Anniversary linking the two countries. Over the last 40 years, Brittany Ferries has become the market leader on the Western Channel for passengers and freight and in 2018 this commitment was further endorsed when Brittany Ferries announced the first ever ferry service linking Ireland and Spain, with the new Ro-Pax twice weekly service from Cork to Santander. As well as serving Cork to Santander, this route also delivers an additional weekly return sailing from Cork to Roscoff.